We have seen the LG G Pro 2 announcing in Korea which claims to be the next flagship from LG. This device will be showcased at the MWC event that is going to start from 24th of this month and many are excited to know more about this device. On the other hand we have seen the Samsung Galaxy Note 3 being one of the most powerful and smart Phablet with its S-Pen features, and we also listed it in the Best Android Smart Phones to buy this month. Now we are going to compare these two Phablets from LG and Samsung and see that are the similarities and differences between them. This information will help you just in-case if you are planning to buy a new device. 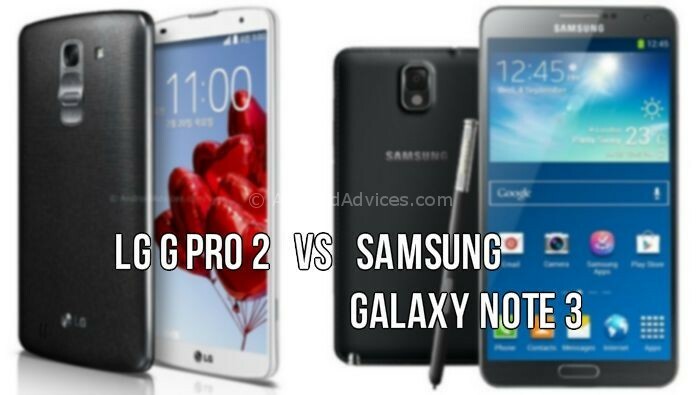 Comparing the Screen of both the device we can say the LG G Pro 2 has slight advantage over the Note 3 as the device from LG flaunts a 5.9 inch screen, where as the device from the Samsung sports a 5.7 inch screen. Both the Phablets have the same resolution of 1920 x 1080 but Note 3 has a higher pixel rate of 386 compared to 373 ppi in LG G Pro 2 because of its increased screen size, but again it won’t be a huge difference that a naked eye can catch. The display used in the Note 3 is AMOLED and the LG used the IPS LCD technology for its device. There is not much of a difference between the both the devices in terms of the weight as the device from the LG weights 172 grams and the device from the Samsung weights 168 grams. The thickness of these Phablets is similar with the LG G Pro 2 measuring at 157.9 x 81.9 x 8.3 mm and Note 3 measuring 151.2 x 79.2 x 8.3 mm. both the devices are similar in the thickness and weight. Once again both the phablets have the same 13 MP rear camera that uses LED flash offering 4K video recording. But the front camera on the LG G Pro 2 is at 2.1 MP and the Note 3 uses a 2 MP camera on its front, so even ever we can’t see much of a difference. The LG G Pro 2 clocks at 2.3 GHz and Note 3 clocks at 2.26 GHz, other than this both the chipsets are Qualcomm Snapdragon 800 and both are quad-core also. Moreover both the devices uses a 3 GB RAM to power the device. The LG G Pro 2 is available in 16 GB and 32 GB variants, where as the Galaxy Note 3 stepped up the challenge with the 64 GB model. However the memory on both the devices can be increased via microSD card slot. LG is one of the few devices that get fast updates of its Operating Systems, only after the Nexus devices. The LG G Pro 2 comes with Android 4.4 KitKat out of the box, but the Galaxy Note 3 is still running in Android 4.3 Jelly Bean. The battery on both the devices is same at 3200 mAh to power the device, so we having nothing to say on this point unless we have our hands on the LG G Pro 2 since battery life varies with the screen technologies used and also with the screen size. Both these flagship devices hare powerful enough and we could not find much of a difference in both of the devices, we cannot conclude anything for the time being as we need to get the device in our hands to comment more about it, as for now we do not have any details about the global release of this device so we need to wait a little more for laying hands on LG G Pro 2.